We demonstrate the clinical use of an MR angiography sequence performed with sparse k-space sampling (MRA), as a method for dynamic contrast-enhanced (DCE)-MRI, and apply it to the assessment of sarcomas for treatment response. Three subjects with sarcomas (2 with osteosarcoma, 1 with high-grade soft tissue sarcomas) underwent MRI after neoadjuvant therapy/prior to surgery, with conventional MRI (T1-weighted, fluid-sensitive, static post-contrast T1-weighted sequences) and DCE-MRI (MRA, time resolution = 7–10 s, TR/TE 2.4/0.9 ms, FOV 40 cm2). Images were reviewed by two observers in consensus who recorded image quality (1 = diagnostic, no significant artifacts, 2 = diagnostic, <25 % artifacts, 3 = nondiagnostic) and contrast enhancement characteristics by static MRI (presence/absence of contrast enhancement, percentage of enhancement) and DCE-MRI (presence/absence of arterial enhancement with time–intensity curves). Results were compared with histological response (defined as <5 % viable tumor [soft tissue sarcoma] or <10 % [bone sarcoma] following resection). Diagnostic quality for all conventional and DCE-MRI sequences was rated as 1. In 2 of the 3 sarcomas, there was good histological response (≤5 % viable tumor); in 1 there was poor response (50 % viable tumor). By static post-contrast T1-weighted sequences, there was enhancement in all sarcomas, regardless of response (up to >75 % with good response, >75 % with poor response). DCE-MRI findings were concordant with histological response (arterial enhancement with poor response, no arterial enhancement with good response). 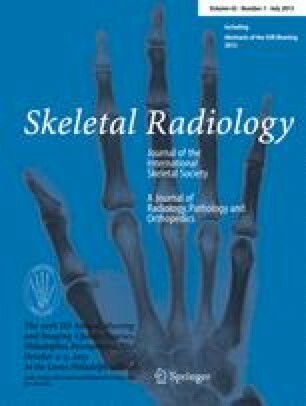 Unlike conventional DCE-MRI sequences, an MRA sequence with sparse k-space sampling is easily integrated into a routine musculoskeletal tumor MRI protocol, with high diagnostic quality. In this preliminary work, tumor enhancement characteristics by DCE-MRI were used to assess treatment response. Grant funding for Laura M. Fayad: General Electric Radiology Research Fellowship (GERRAF 2008–2010) and Siemens Healthcare 2011–2012 for funding of projects related to the assessment of musculoskeletal tumors by proton MR spectroscopy.